Aquaporin 1 is a protein that in humans is encoded by the AQP1 gene. 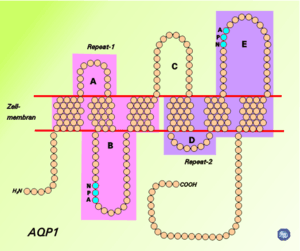 AQP1 is a widely expressed water channel, whose physiological function has been most thoroughly characterized in the kidney. It is found in the basolateral and apical plasma membranes of the proximal tubules, the descending limb of the loop of Henle, and in the descending portion of the vasa recta. Additionally, it is found in red blood cells, vascular endothelium, the gastrointestinal tract, sweat glands, and lungs. It is not regulated by vasopressin (ADH). Aquaporins are a family of small integral membrane proteins related to the major intrinsic protein (MIP or AQP0). This gene encodes an aquaporin which functions as a molecular water channel protein. It is a homotetramer with 6 bilayer spanning domains and N-glycosylation sites. The protein physically resembles channel proteins and is abundant in erythrocytes and renal tubes. The gene encoding this aquaporin is a possible candidate for disorders involving imbalance in ocular fluid movement. ↑ "Drugs that physically interact with Aquaporin-1 view/edit references on wikidata". ↑ "Entrez Gene: AQP1 aquaporin 1 (Colton blood group)". Knepper MA (1994). "The aquaporin family of molecular water channels.". Proc. Natl. Acad. Sci. U.S.A. 91 (14): 6255–8. doi:10.1073/pnas.91.14.6255. PMC 44179 . PMID 7517546. Borgnia M, Nielsen S, Engel A, Agre P (2000). "Cellular and molecular biology of the aquaporin water channels.". Annu. Rev. Biochem. 68: 425–58. doi:10.1146/annurev.biochem.68.1.425. PMID 10872456. Horster M (2001). "Embryonic epithelial membrane transporters.". Am. J. Physiol. Renal Physiol. 279 (6): F982–96. PMID 11097616. Yool AJ, Weinstein AM (2002). "New roles for old holes: ion channel function in aquaporin-1.". News Physiol. Sci. 17: 68–72. PMID 11909995. Mitra AK, Ren G, Reddy VS, Cheng A, Froger A (2002). "The architecture of a water-selective pore in the lipid bilayer visualized by electron crystallography in vitreous ice". Novartis Found. Symp. Novartis Foundation Symposia. 245: 33–46; discussion 46–50; 165–8. doi:10.1002/0470868759.ch4. ISBN 978-0-470-86875-1. PMID 12027013. Ripoche P, Goossens D, Devuyst O, Gane P, Colin Y, Verkman AS, Cartron JP (2006). "Role of RhAG and AQP1 in NH3 and CO2 gas transport in red cell ghosts: a stopped-flow analysis". Transfusion clinique et biologique : journal de la Société française de transfusion sanguine. 13 (1–2): 117–22. doi:10.1016/j.tracli.2006.03.004. PMID 16574458. Preston GM, Carroll TP, Guggino WB, Agre P (1992). "Appearance of water channels in Xenopus oocytes expressing red cell CHIP28 protein". Science. 256 (5055): 385–7. doi:10.1126/science.256.5055.385. PMID 1373524. Preston GM, Agre P (1992). "Isolation of the cDNA for erythrocyte integral membrane protein of 28 kilodaltons: member of an ancient channel family". Proc. Natl. Acad. Sci. U.S.A. 88 (24): 11110–4. doi:10.1073/pnas.88.24.11110. PMC 53083 . PMID 1722319. Smith BL, Agre P (1991). "Erythrocyte Mr 28,000 transmembrane protein exists as a multisubunit oligomer similar to channel proteins". J. Biol. Chem. 266 (10): 6407–15. PMID 2007592. Denker BM, Smith BL, Kuhajda FP, Agre P (1988). "Identification, purification, and partial characterization of a novel Mr 28,000 integral membrane protein from erythrocytes and renal tubules". J. Biol. Chem. 263 (30): 15634–42. PMID 3049610. Zelinski T, Kaita H, Lewis M, Coghlan G, Philipps S, Belcher E, McAlpine PJ, Coopland G, Wong P (1988). "The Colton blood group locus. A linkage analysis". Transfusion. 28 (5): 435–8. doi:10.1046/j.1537-2995.1988.28588337331.x. PMID 3166547. Preston GM, Jung JS, Guggino WB, Agre P (1994). "Membrane topology of aquaporin CHIP. Analysis of functional epitope-scanning mutants by vectorial proteolysis". J. Biol. Chem. 269 (3): 1668–73. PMID 7507481. Skach WR, Shi LB, Calayag MC, Frigeri A, Lingappa VR, Verkman AS (1994). "Biogenesis and transmembrane topology of the CHIP28 water channel at the endoplasmic reticulum". J. Cell Biol. 125 (4): 803–15. doi:10.1083/jcb.125.4.803. PMC 2120064 . PMID 7514605. Li X, Yu H, Koide SS (1994). "The water channel gene in human uterus". Biochem. Mol. Biol. Int. 32 (2): 371–7. PMID 7517253. Walz T, Smith BL, Agre P, Engel A (1994). "The three-dimensional structure of human erythrocyte aquaporin CHIP". EMBO J. 13 (13): 2985–93. PMC 395186 . PMID 7518771. Preston GM, Smith BL, Zeidel ML, Moulds JJ, Agre P (1994). "Mutations in aquaporin-1 in phenotypically normal humans without functional CHIP water channels". Science. 265 (5178): 1585–7. doi:10.1126/science.7521540. PMID 7521540. Smith BL, Preston GM, Spring FA, Anstee DJ, Agre P (1994). "Human red cell aquaporin CHIP. I. Molecular characterization of ABH and Colton blood group antigens". J. Clin. Invest. 94 (3): 1043–9. doi:10.1172/JCI117418. PMC 295159 . PMID 7521882.
van Hoek AN, Wiener MC, Verbavatz JM, Brown D, Lipniunas PH, Townsend RR, Verkman AS (1995). "Purification and structure-function analysis of native, PNGase F-treated, and endo-beta-galactosidase-treated CHIP28 water channels". Biochemistry. 34 (7): 2212–9. doi:10.1021/bi00007a015. PMID 7532004. Keen TJ, Inglehearn CF, Patel RJ, Green ED, Peluso DC, Bhattacharya SS (1995). "Localization of the aquaporin 1 (AQP1) gene within a YAC contig containing the polymorphic markers D7S632 and D7S526". Genomics. 25 (2): 599–600. doi:10.1016/0888-7543(95)80070-3. PMID 7540589.